September is Pain Awareness Month. A recent study has shown over 100 million Americans suffer from pain. The American Chronic Pain Association (ACPA) established September as Pain Awareness Month in 2001. Since then, numerous organizations have given their effort to increase public awareness on all aspects of pain and pain management. A multicolored “pain warrior” bracelet is being used as a symbol for this awareness. The U.S. Pain Foundation developed the pain warrior bracelet as campaign to unite, strengthen, and encourage the pain community to keep fighting for proper care. The multiple color rainbow of the bracelet helps to symbolize unity and our resilience to overcome, our ability to face adversity, and our courage to continue living. Pain Awareness Month is a time to help educate and promote the awareness of pain that may otherwise be invisible, like: lupus, arthritis, reflex sympathetic dystrophy, multiple sclerosis and more. A wide range of events including workshops, lectures, social media activities, and virtual campaigns are held to enable people to step out of isolation that chronic pain can bring. Chiropractors of Dickson, TN of course agree in pain, chronic or recent deserves attention. And the best way to get attention is by participating. Update Your Profile Picture: The U.S. Pain Foundation has created an amazing free graphic related to the awareness. This graphic picture is available for everyone. You can use the graphic as your profile photo for the entire month of September. By doing so you can help pass along the message to all your social media friends. Follow Social Media Accounts of Pain-relieving Organizations: Many organizations make posts on the latest research in pain-healing technologies and advocacy opportunities. When you follow their social media accounts you also stay informed, gaining insight about pain management techniques. Shop to Support the Cause: Wear bracelets, t-shirts, and other accessories that support the cause. Many online stores offer chronic pain-related products to promote the campaign. 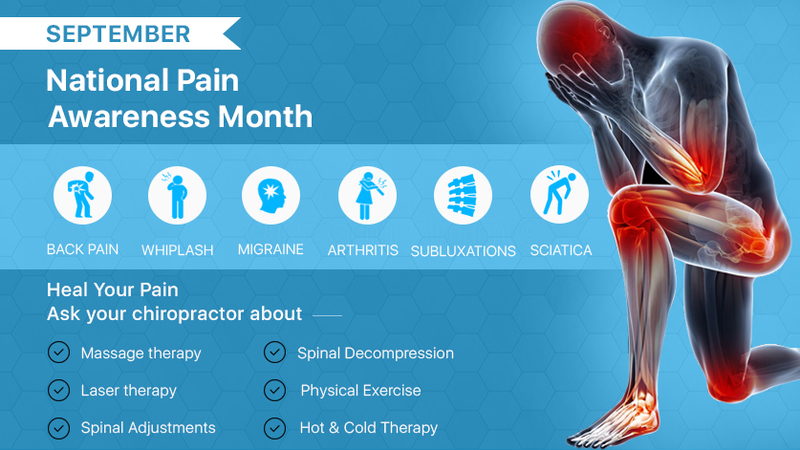 While actively participating in these activities, make sure you visit a chiropractic center in Dickson to help heal your pain. Visit http://dickson-chiropractic.com to learn how chiropractic care can relieve your pain.